Is there anyone who lived through that day who does not remember where they were on 9/11? We were living in the Washington, DC, area. The Pentagon was hit. Friends were inside. Who can forget the Twin Towers going down? A shocked world watched on television as the scene was played over and over. My son was on a Lufthansa flight scheduled to land at Dulles Airport at 1:30 pm on September 11, 2001. 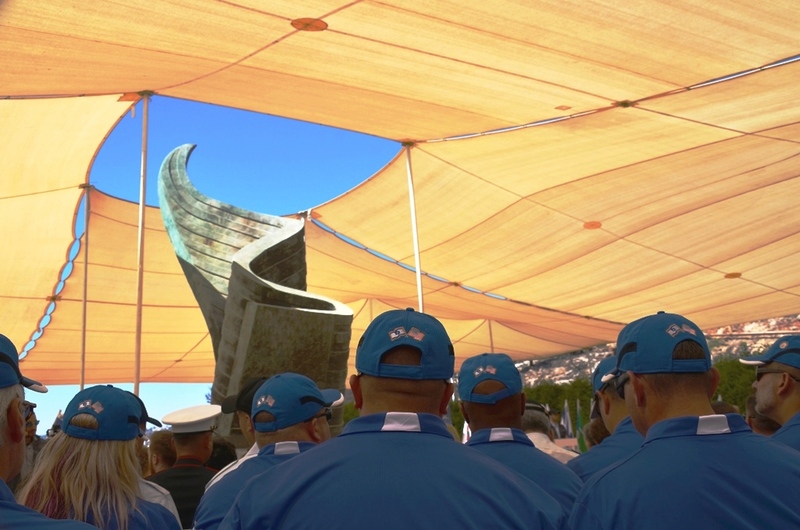 After spending a week in Gander, Newfoundland, he finally made it home for Rosh Hashana, but that is a story for another time. 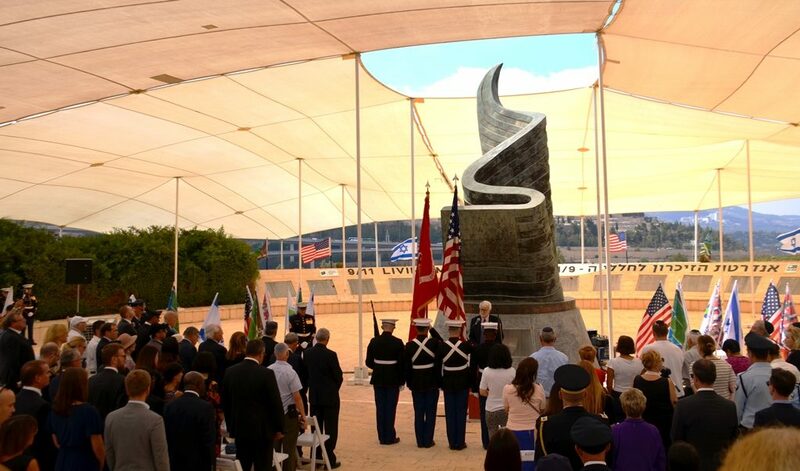 Each year, an US-Israel joint memorial commemoration is held on September 11th. 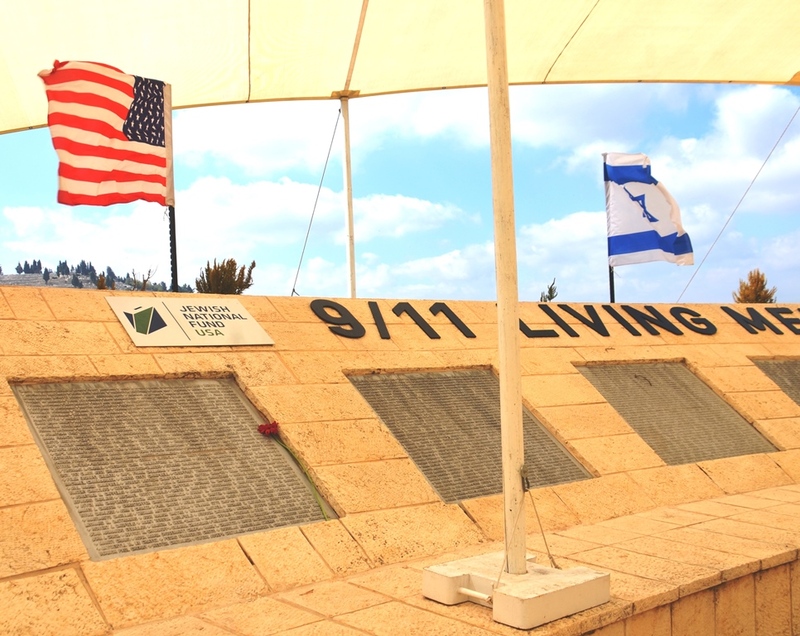 However, with the second day of Rosh Hashana falling on 9/11, this year the event was held on the Thursday before. 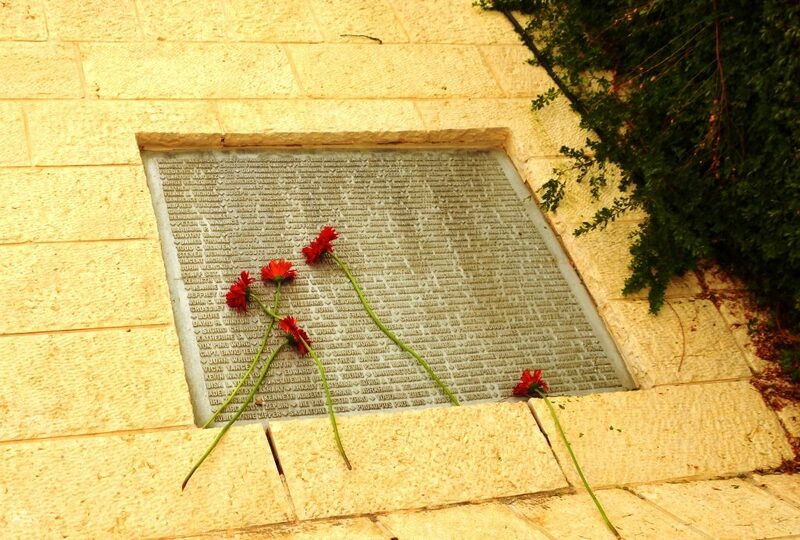 The memorial, located in a JNF-KKL park in the hills of Jerusalem, is the only one outside the United States that lists all the names of victims. Representatives of different groups are invited each year. 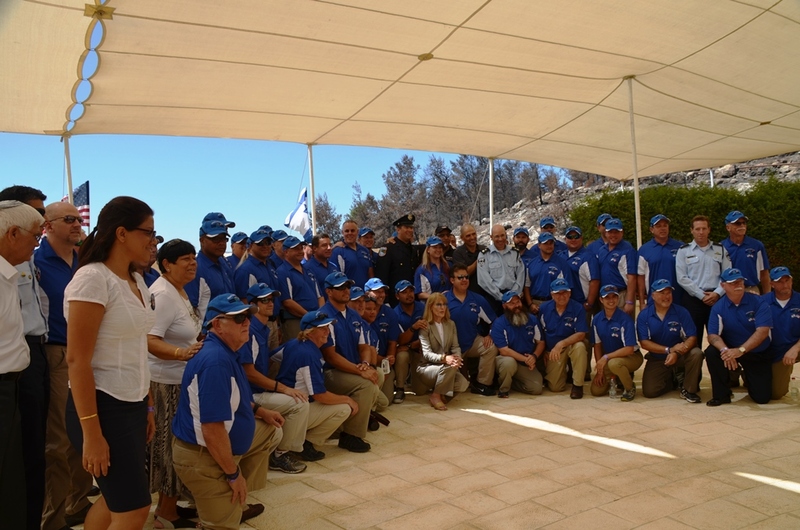 This year Sar-El, Muss High School, and Nefesh BeNefesh were among the guests who came on special buses, and passed through layers of special security. 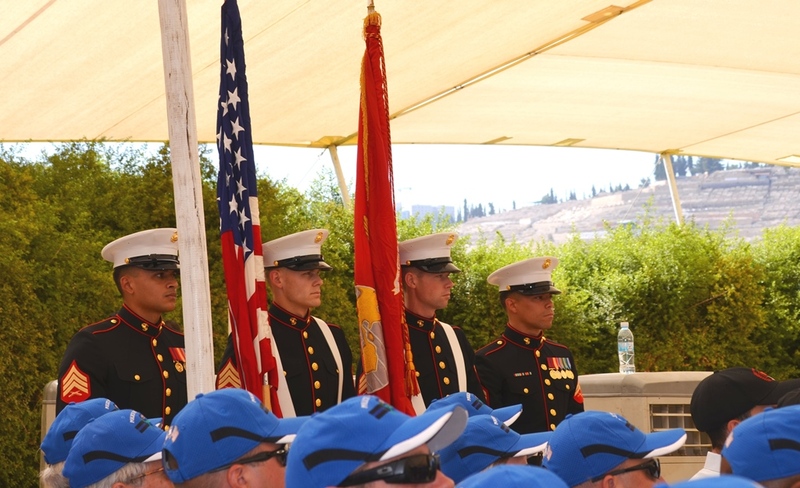 Here the US Honor Guard readies its flags to march in and begin the memorial program. 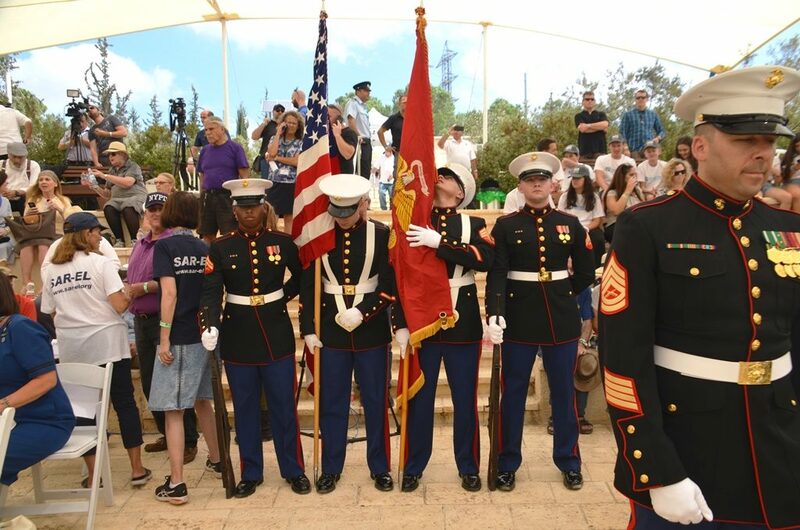 The Honor Guard and all guests stood for the the US anthem. 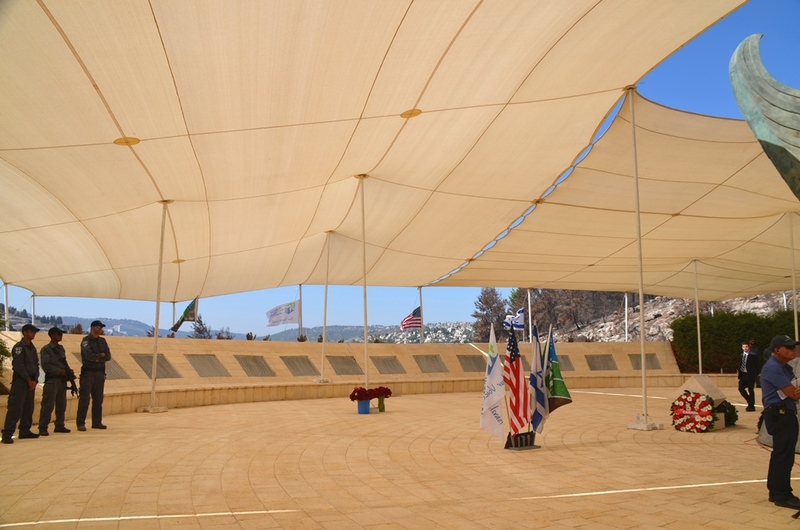 A special cover was constructed to shield the gathering from the midday sun. This year was not too hot, but plenty of water was provided nonetheless. 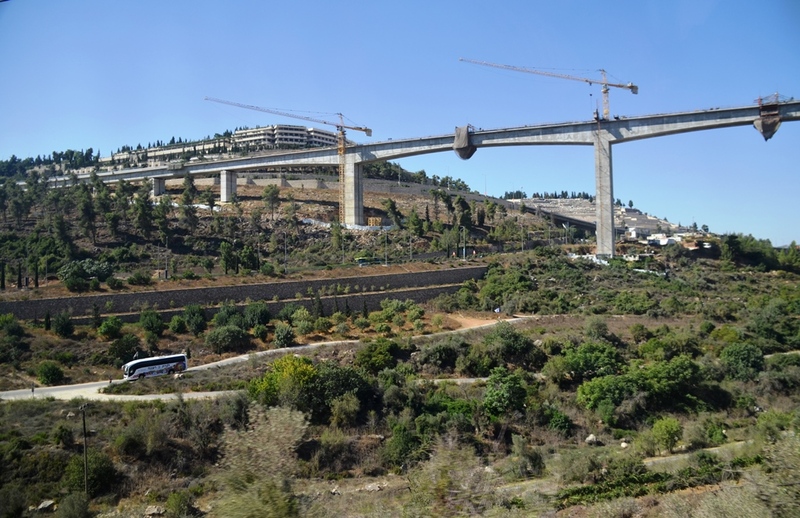 From the memorial you can see across Route One to the main Jerusalem cemetery, and in the distance, the Hadassah Hospital complex in Ein Karem is visible. 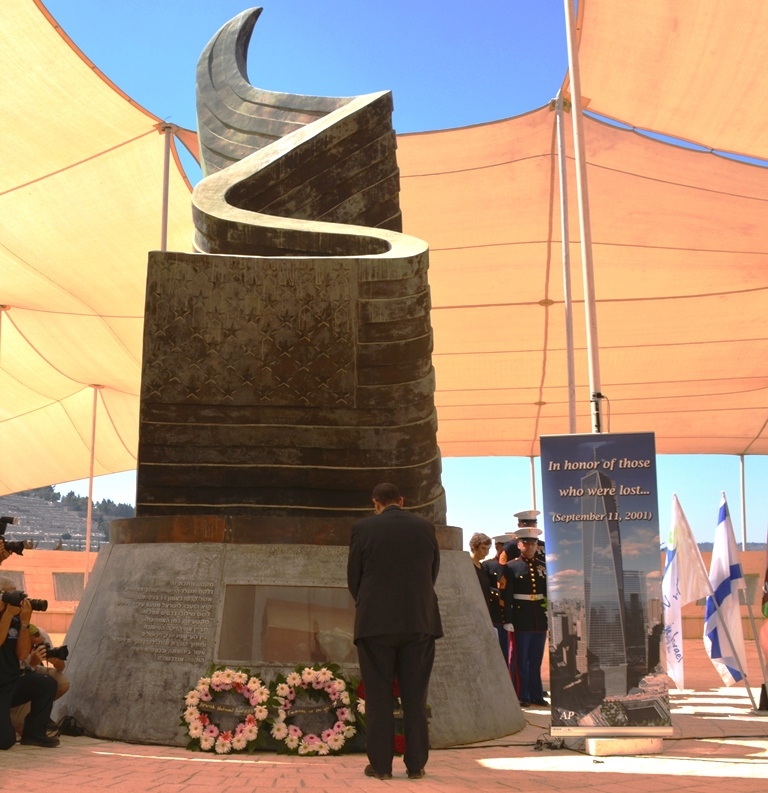 The main monument depicts an US flag in shape of a flame. 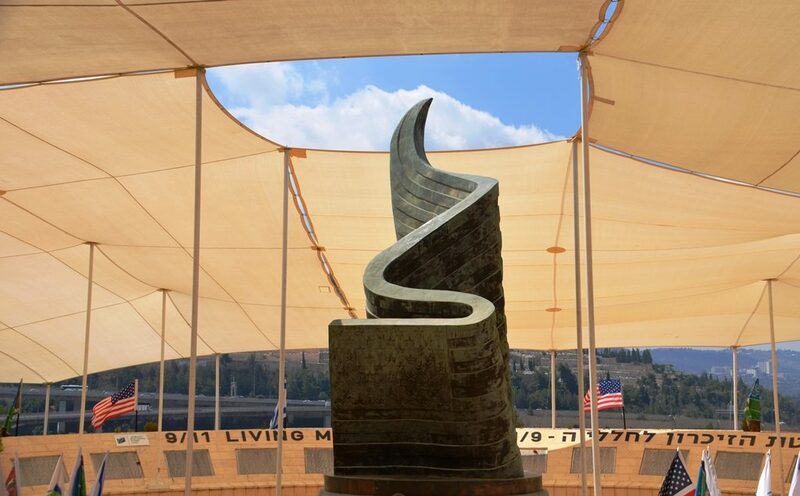 The impressive thirty-foot-high bronze sculpture was created by Israeli artist Eliezer Weishoff and landscape architect Yechiel Cohen. 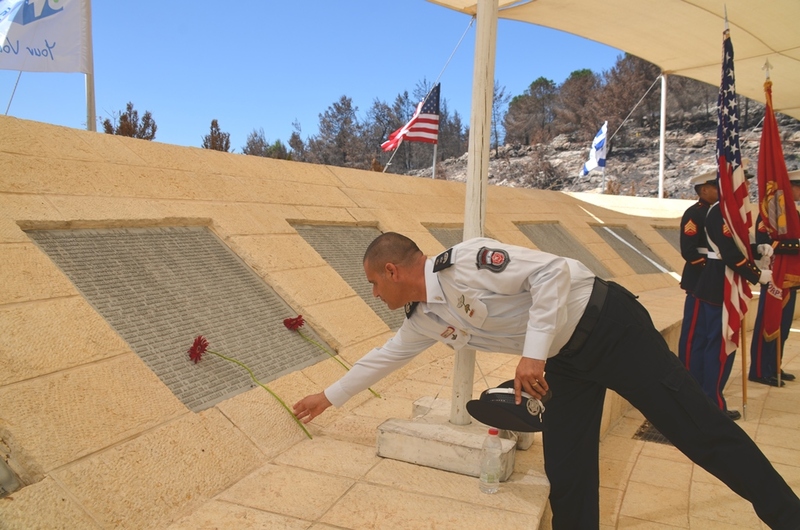 The annual program began with the Kaddish, the prayer recited for the departed, recited by a close relative of a victim, on behalf of all those who fell. 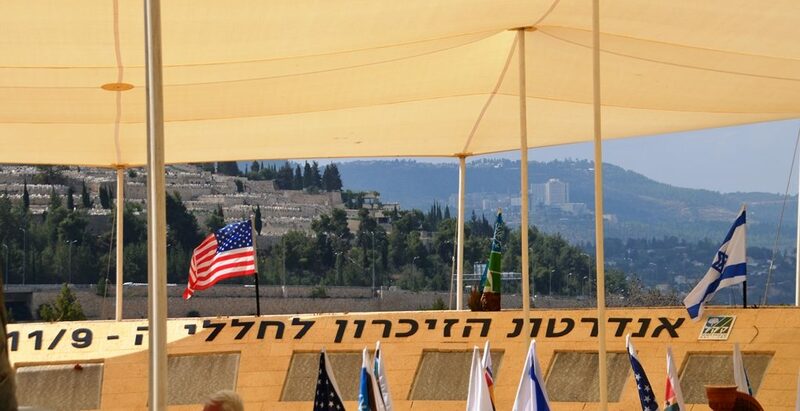 MK Nachman Shai spoke representing the Israeli government. 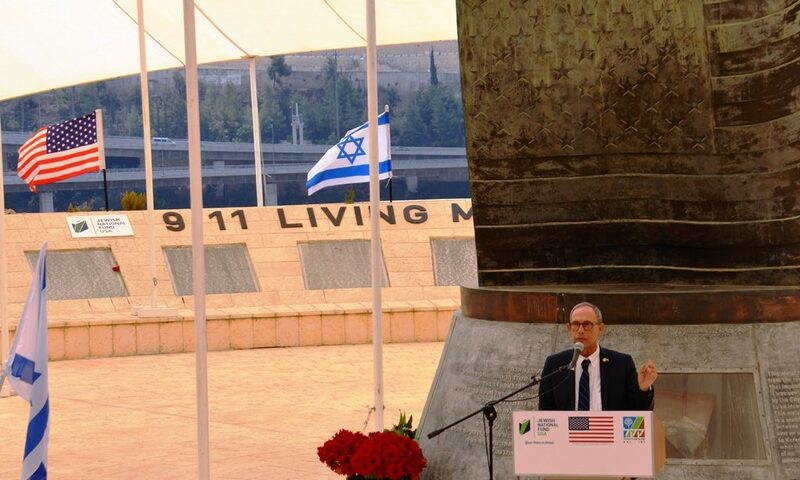 Other speakers included diplomatic representatives, JNF-KKL leaders, and family members of victims. 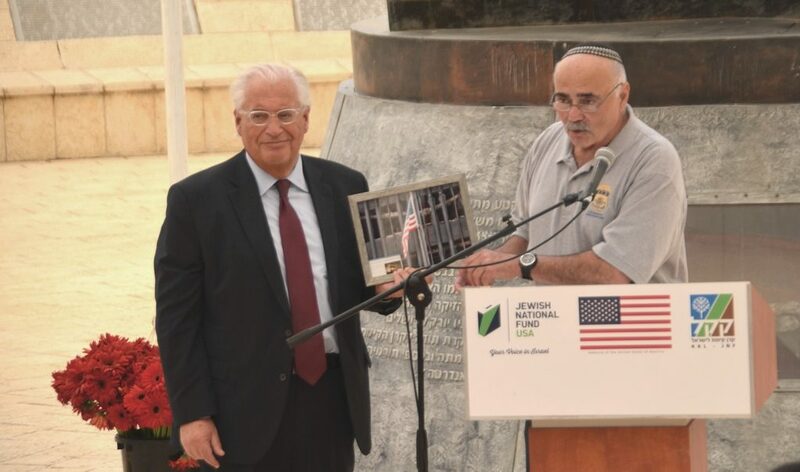 Ambassador David Friedman was presented with a framed photo of the US flag taken in front of the destroyed NYC building by a witness. 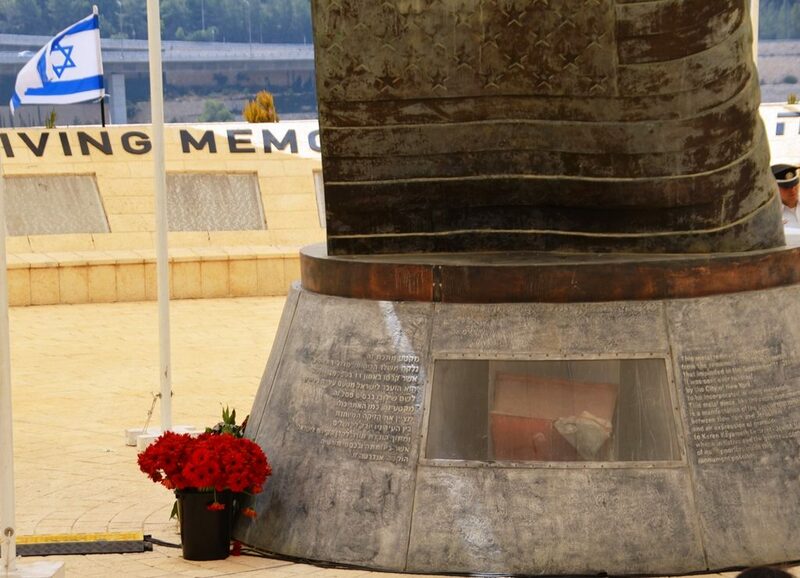 Inside the memorial, partially concealed behind the podium, is a piece of metal salvaged from the site of the destroyed towers. After the speeches. 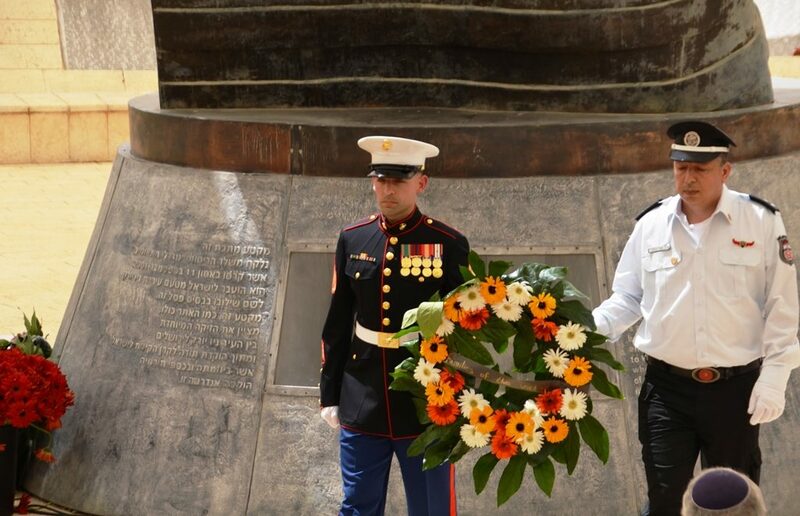 representatives of the military, fire and police assisted with the placing of memorial wreaths. 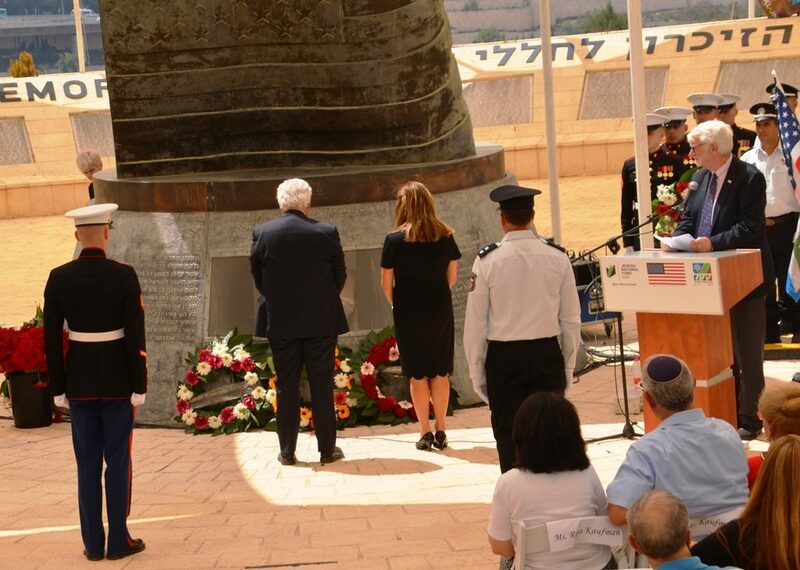 After placing a wreath, Ambassador and Tammy Friedman paused for a moment of silence. 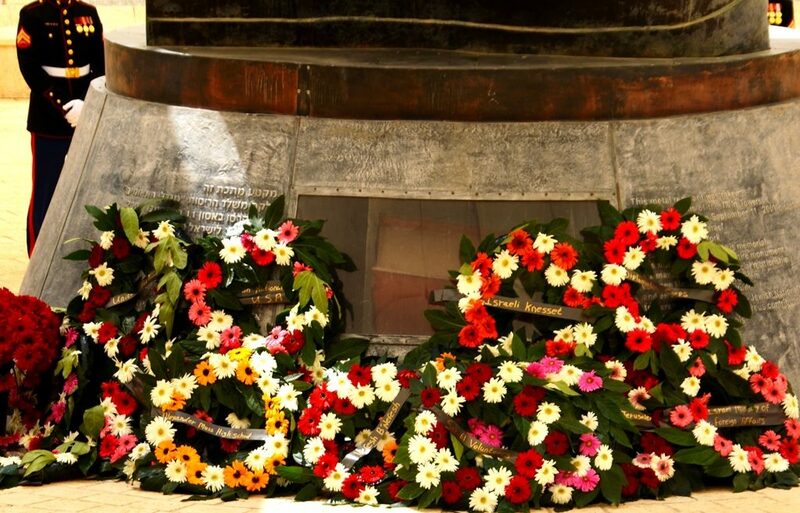 At the end of the formal program, all the wreaths were placed at the base of the memorial. 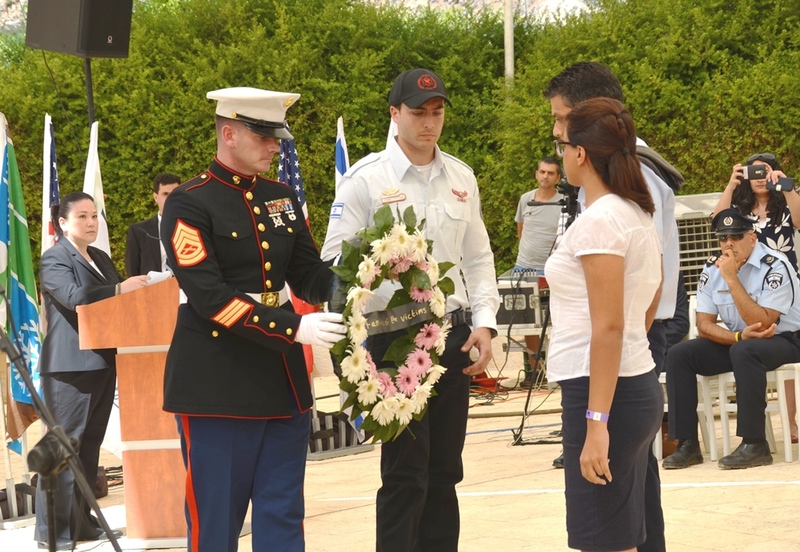 Flowers were available to place by the names of fallen. 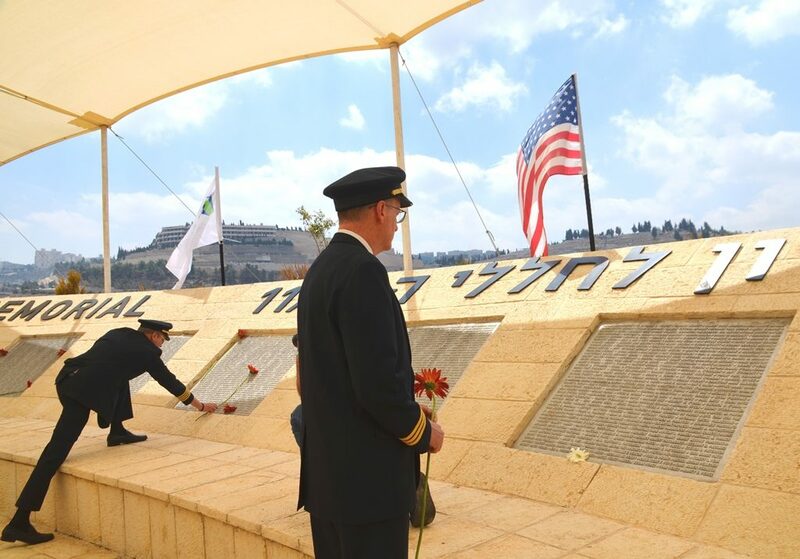 These United Airlines pilots stopped to reflect and remember. 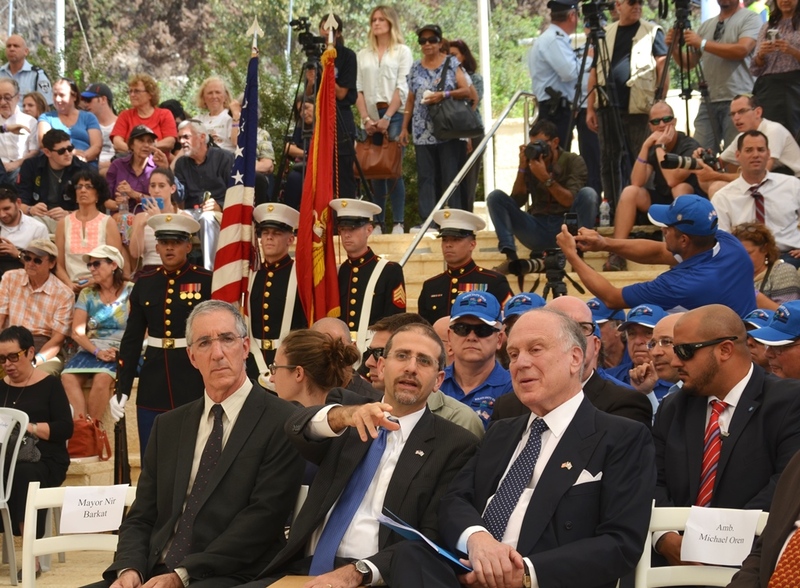 Remembrance and Rosh Hashana were significant topics in Ambassador Friedman’s remarks. 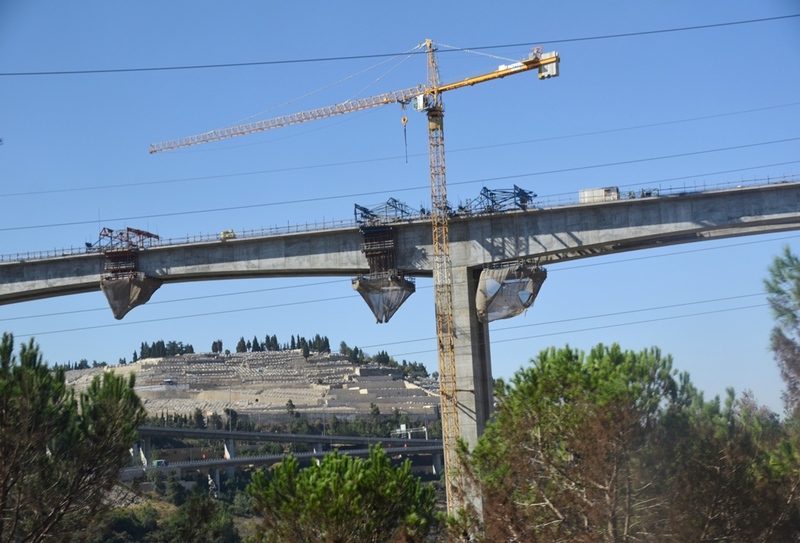 As the bus slowly traveled back up the winding narrow park road, the bridge for the new Jerusalem-Tel Aviv fast train towered overhead. 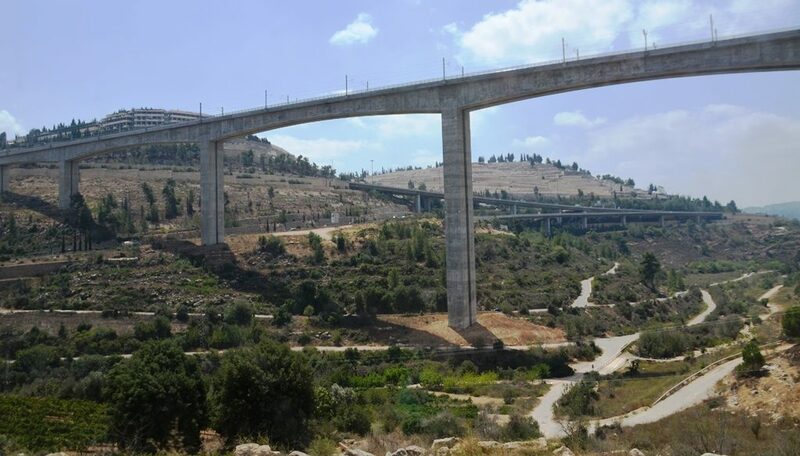 On the other side of the support pillars, the new Jerusalem highway winds around the mountainside. 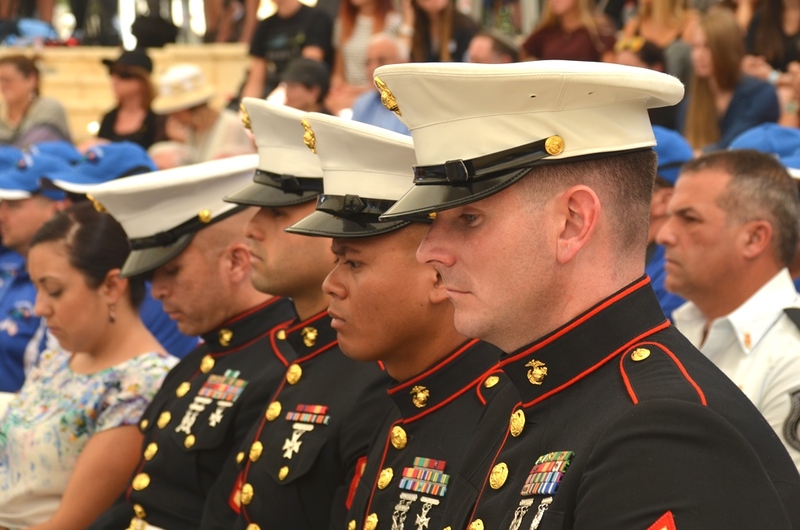 People will be able to access the 9/11 memorial more easily in the future, as the park is currently being developed to be more family-friendly. Wishing all a good new year.